Carte du Royaume de Danemarc. 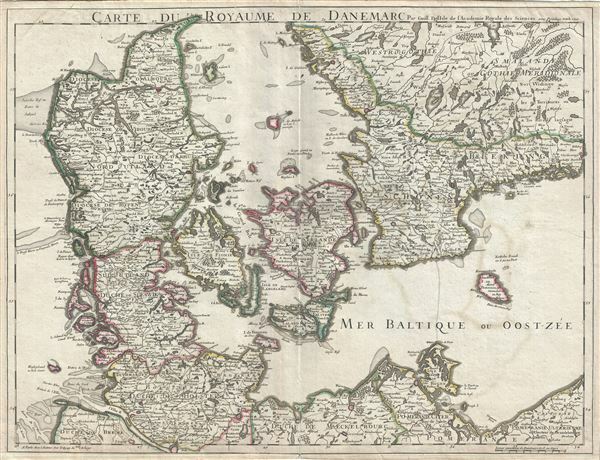 This is a beautiful 1710 map of Denmark by Guillaume De L'isle. It covers all of Jutland and the islands of Zealand, Funen and Lolland. Parts of southern Sweden and northern Germany are also included. The map renders the entire region in extraordinary detail offering both topographical and political information with forest and mountains beautifully rendered in profile. Some coastal features are also included. This map was created by Guillaume De L'isle in 1710 and was included in the Atlas de Geographie. Very good. Minor wear and verso repair along original centerfold. Original platemark visible. Minor offsetting and spotting.